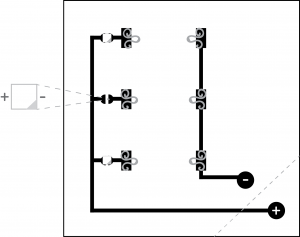 Description: This swatch uses hook-and-eye closures that can act as a sequence of switches or sensors to detect tightness. The more you pull, the brighter the LEDs become. It is part of a series of exercises that pulls brainstorming techniques from game design into computational craft practices. 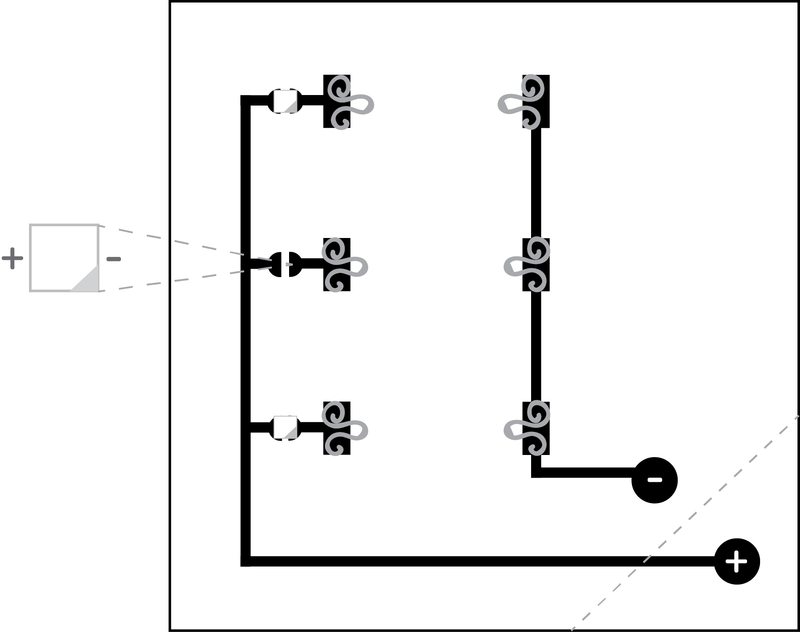 I begin by looking at the mechanics of an interaction, then translating it into a sensor. More often than not in game design, you start with the interaction – the core mechanic – that will be at the center of your system. It determines how players interact with each other and how they feel about the experience as a whole. Incorporating this into my practice, it has generated more playful and whimsically functional ideas in addition to deepening my focus on the interaction. 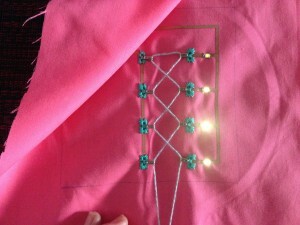 I created the circuit by fusing one side of the copper fabric to interfacing, then cut the traces using a vinyl cutter. 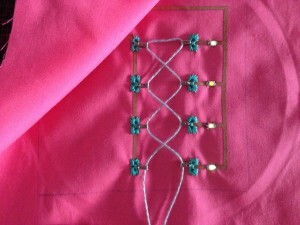 I adhered the traces to a 5×5 inch piece of calico, the sewed a hook to each square using conductive thread. In order to insulate the thread, strengthen the hook, and add aesthetic, I embroidered the base of the hook using a variety of techniques. Finally, I soldered the LEDs onto the copper fabric. Note: Apply solder to the LEDs first, then reheat the solder to adhere to the copper fabric – otherwise it will heat up too much and break.